The Daily Digress: Ladies, we work hard. And we deserve to be greeted at the end of the day with a cocktail tray, stocked with a fancy drink, some chocolate and something every woman should have, a pair of Daniel Green house shoes. These are not mere slippers. Oh, no! They are high class. They are the ultimate in fashionable lounge footwear. They go with everything: your favorite mumu, jeans, a nice cocktail dress if you're entertaining, yoga pants*. You name it and Daniel Greens will complete the look. My Grandmother was the first person I ever saw rock the Daniel Greens and I think my generation needs to take note. They are so stylish! They are more comfortable than you could possibly imagine! They offer so much support to the feet! After I was finished waxing rhapsodic about my new pair, my mother tried to burst my bubble of fabulousness. "Main and Taylor doesn't even carry those any more. They're too expensive," she sniffed, implying that only someone as silly as myself would waste a vast fortune on slippers. Au contraire, ma mère. Although it's true (and very sad!) that Main and Taylor no longer carries them, I wouldn't describe them as terribly pricey. I got mine for the very reasonable price of $24 from Endless.com. While that may be expensive for slippers, these are not, as I said before, mere slippers. They are lifestyle enhancing lounge shoes. Got it? 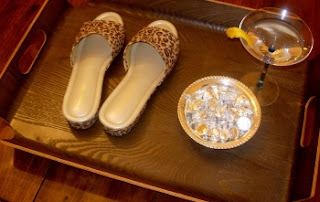 So, ladies, when your man gets home from a long day at work (or some other guy - your neighbor, the UPS guy, one of your kids), park your sweet self on the sofa, put your feet up and ring for your cocktail tray. You deserve it**! * Public Service Announcement: Please don't confuse Yoga pants with sweat pants. Sweat pants are gross. Yoga pants are equally comfortable, but more expensive. And they make you look healthy. Sweat pants make you look like you just got dumped, are hungover and have eaten an entire family size bag of potato chips, chased with the greater part of a Whitman's Sampler and a liter of Diet Coke. Mind you, there's absolutely nothing wrong with that. We've all been there. Just do it in some nice Yoga pants and throw those nasty sweat pants away. Thank you! ** Well, not really. But who deserves anything besides food, shelter and love? And health care, depending on which side of the political fence you're on. You don't deserve a cocktail tray at the end of the day, but why not have one anyway? Get it for yourself if no one else will. I bought Daniel Green's a few years ago and they ended up being too small, but I've been wanting to replace them because they were SO comfortable in every other sense!